Josh and I have had our Christmas tree up for 3, going on 4, weeks now. Due to my lack of patience to get a tree we put ours up the weekend before Thanksgiving and I'm so glad that we did because we get to enjoy it a little longer because Thanksgiving was a touch late this year. And y'all...I'm seriously not sure if I'm ever going to take the tree down! Kidding, of course. But I'm so in love with how it turned out...you can sometimes find me sitting in front of it just staring at it...crazy, I know. "During this Advent, whenever we see a lighted Christmas tree, we will be reminded of the One who brings light to our darkness, healing to our brokenness, and peace to all who receive Him." There's just something about the combination of it being our first tree, in our first house, for our first year of marriage, for our first married Christmas, the beautiful ornaments, and the twinkling lights that just make me fall in love with it. I'll be really sad to take it down, mark my words. There's a local market right down the street from our house that my parents have been getting their tree from for the past few years, before that we had a fake tree. So we headed to the market with mom and dad and picked out, what I think, is the most beautiful tree and took that baby home. I think you're supposed to let it sit for a day or two to settle or something like that...but no way was I waiting that long to decorate haha! It ended up sitting for a few hours before it was filled with lights and ornaments. Mom gave us a ton of ornaments she had used in years past. I kid you not, the woman buys new ornaments like every other year haha! 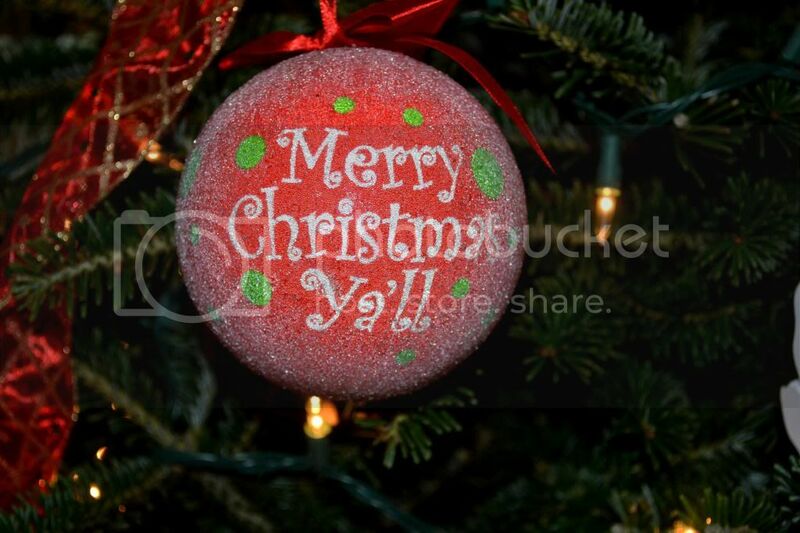 So we stocked up on those, I got my sentimental ornaments from growing up and we already had all of Josh's ornaments. 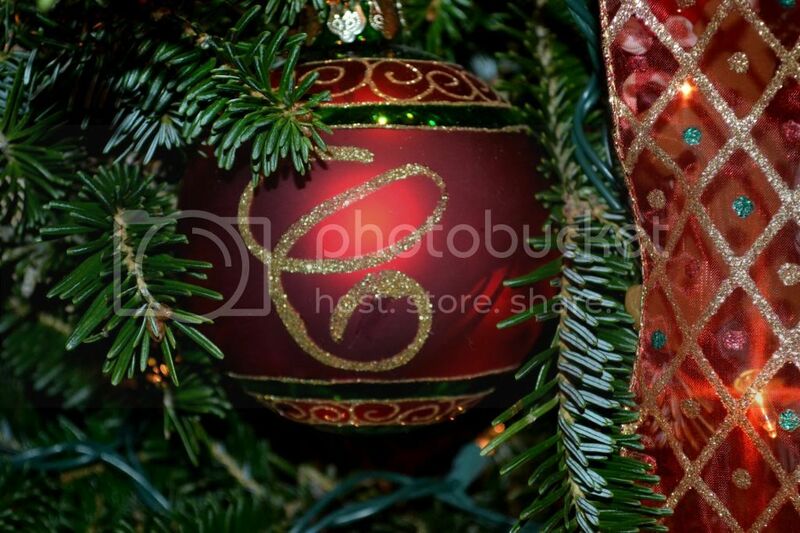 These are just a few of my favorite ornaments! 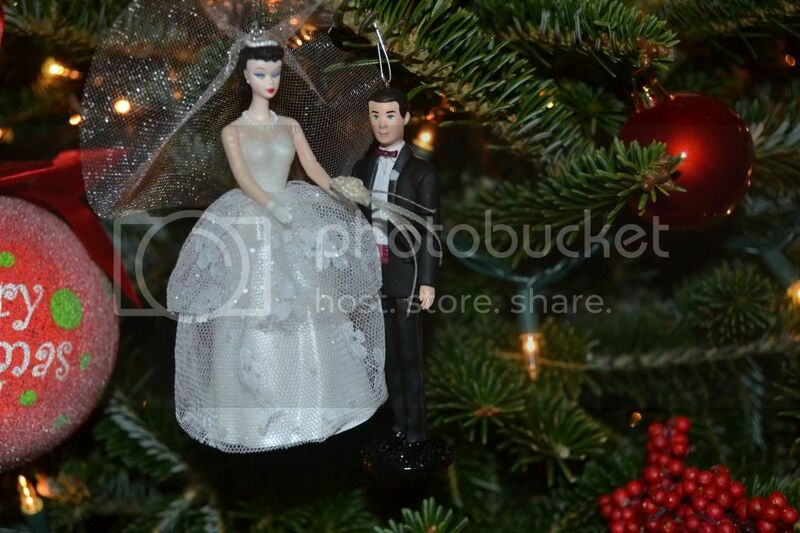 Do you die over wedding Barbie and Ken? Mom gifted that one to us! We picked up the Hilton Head on our honeymoon and we couldn't have a tree without a dog bone on it for Murphy! We also have two more puppy ornaments on there for him. 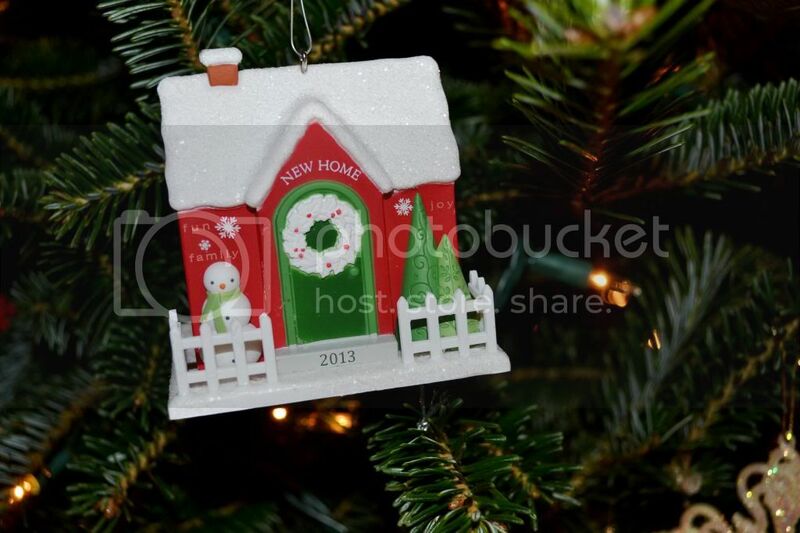 Mom also gave us the new home ornament and it's too stinking cute! 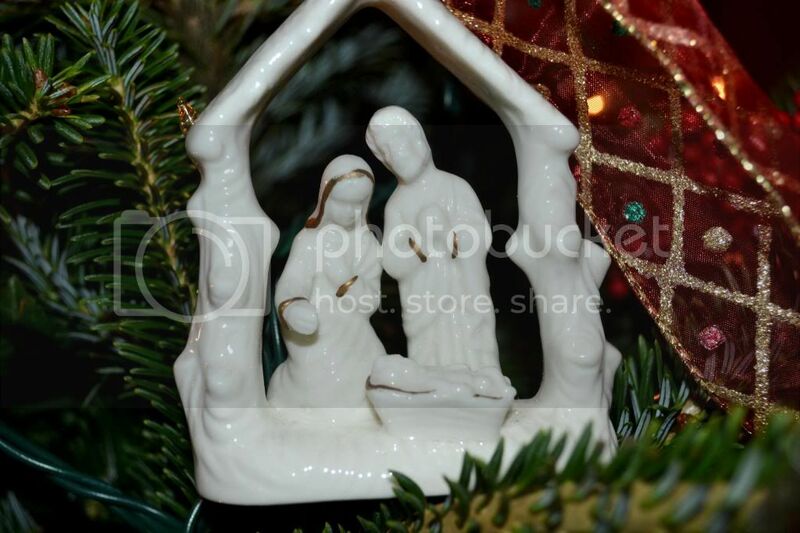 And I LOVE our nativity scene ornament...that's my favorite from mom's stash that she let us have. 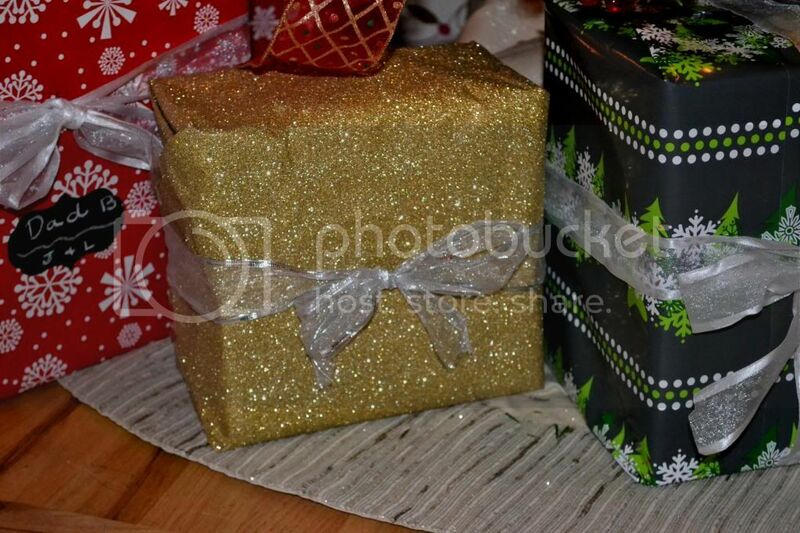 For wrapping paper I actually found a GORGEOUS sparkly red and gold roll at none other than Goodwill and I was so excited about it and still am...but...it's impossible to wrap with, no tape sticks to it and it gets glitter everywhere...every.where. So I did two gifts in it to pretty up the tree and then quit with it ha! Mom to the rescue again, she gave us the rest of the wrapping paper that you see under the tree...she has more wrapping paper than any person I know and was kind enough to give us some. 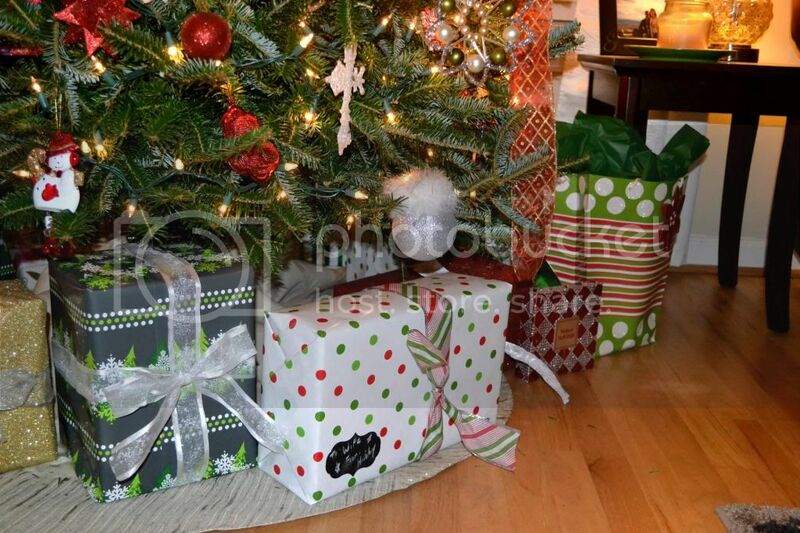 I was (stupidly) stressing out over what tags we were going to do on the gifts. 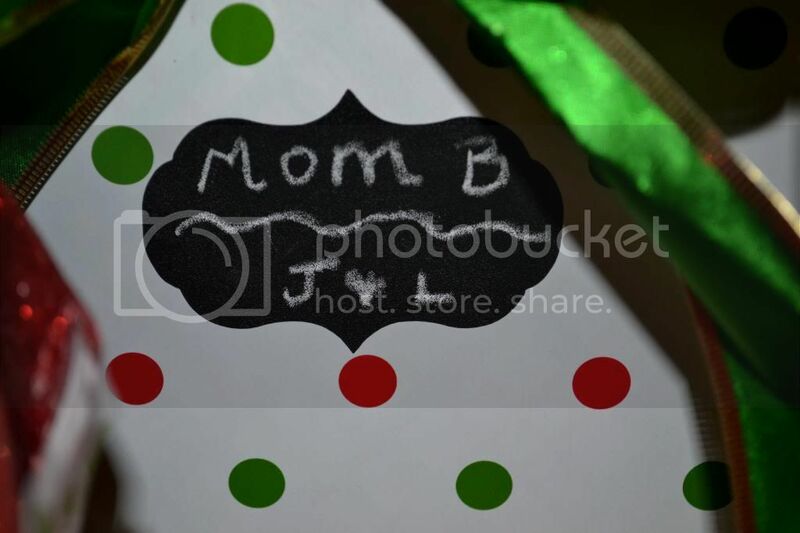 I love a good Christmas tag and when I found these little chalkboard tags on either Jane.com or on Groopdealz (I can't remember) I jumped on ordering them and adore them. 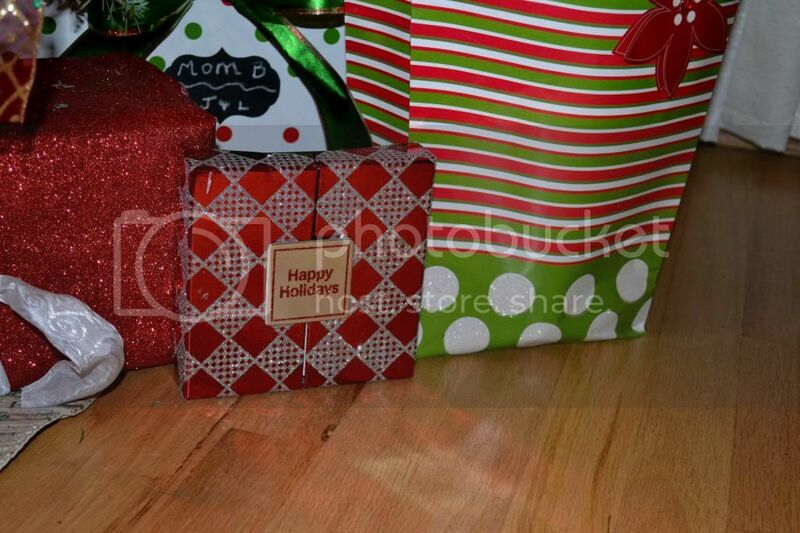 The cute little red box that you see below that says "Happy Holidays" is what I got to hold gift cards this year. 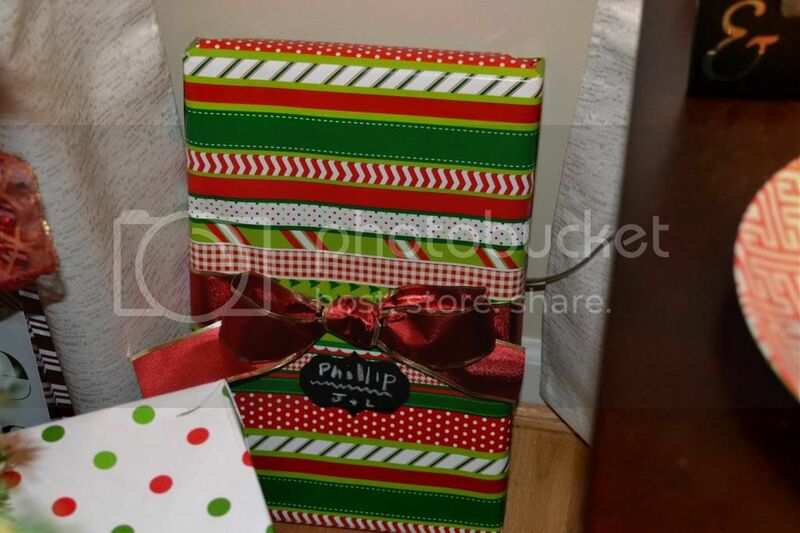 I love a good box to put a gift card in to make it a little more festive :) I'm also mildly obsessed with ribbon instead of stick-on bows. Josh is the opposite and is a fan of the bows. 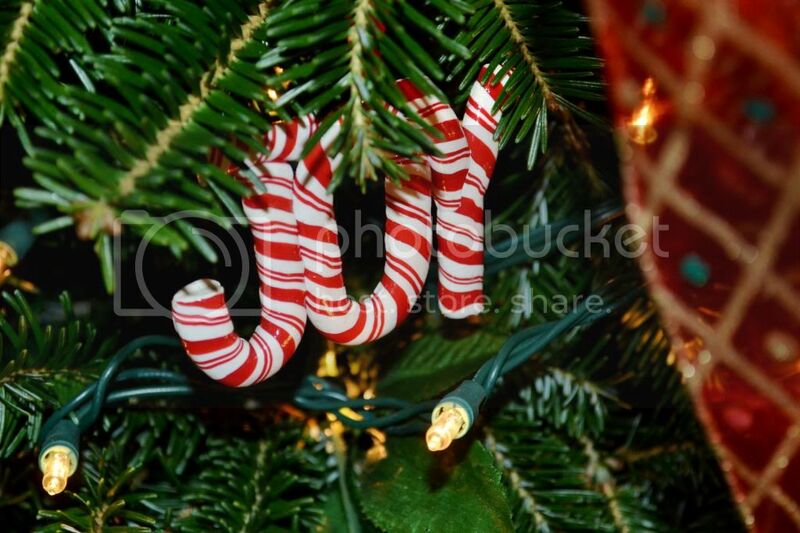 Lucky for me, we had tons of ribbon and no bows so ribbon for the win this year! 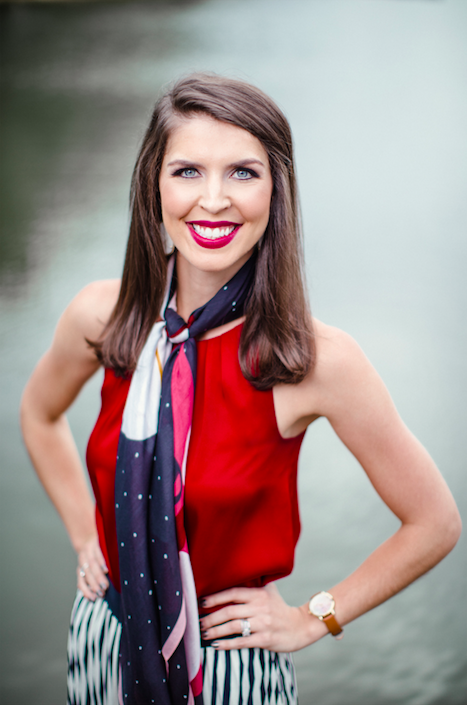 More wedding recaps are on tap for this week along with a few more Christmas-y things! I hope your Monday is great! 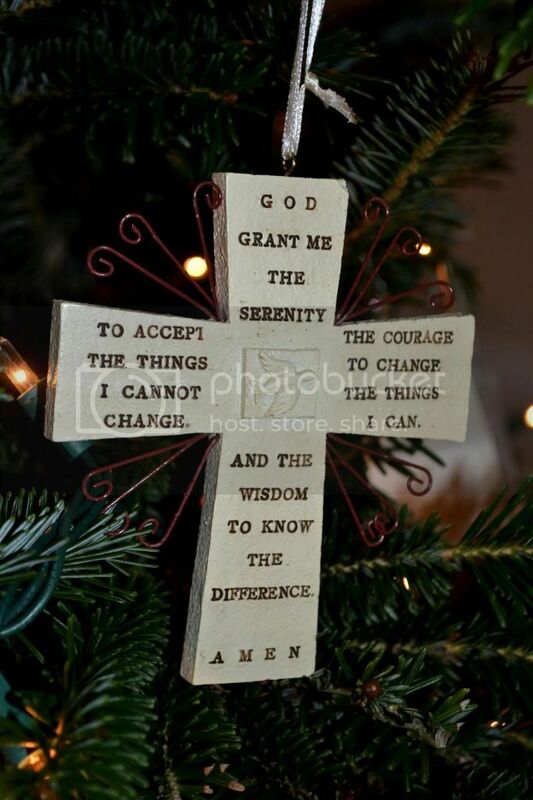 I love your serenity prayer ornament (one of my favorites) and your Harbor Town ornament! 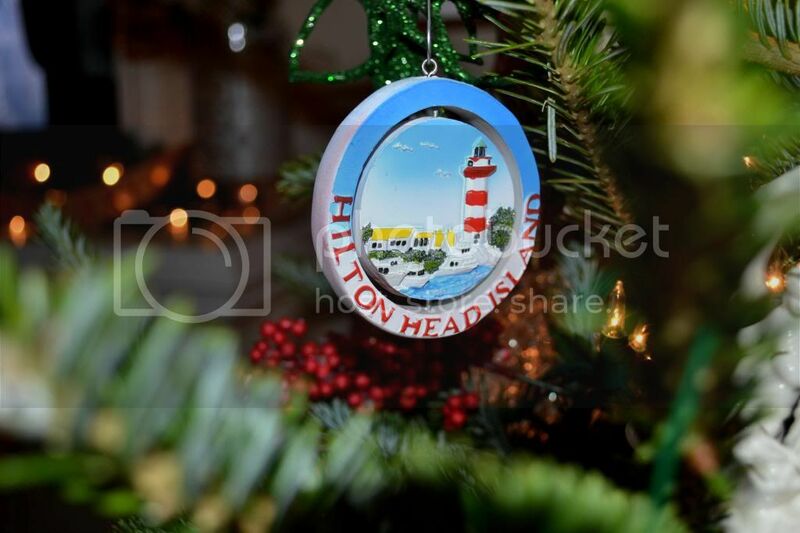 My parents have a house right near Harbor Town and we need to get an ornament like that! Great Advent reminder. I'll be keeping that in mind this Advent season!